This article covers an online service to create recurring team workflows with reusable templates. The name of this service is TeamworkIQ. 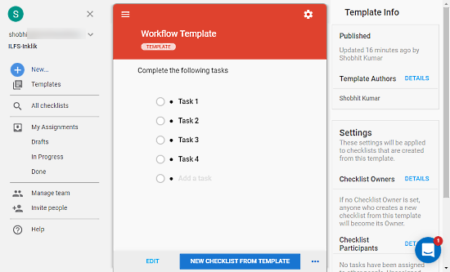 With TeamworkIQ, you can create workflow templates and use those template to make checklists to manage the workflow and assign the tasks to the team members. Team members then mark the tasks done from their end upon completion. 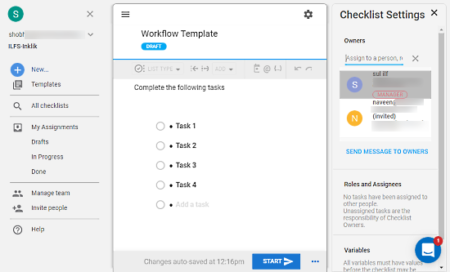 TeamworkIQ saves you from the hurdle of creating checklists for recurring workflows from scratch. You can create a collection of templates for all types of workflows of your team and save yourself lots of time. At the time of this writing, this service is in Beta phase and free to use. Managing the team workflow with TeamworkIQ is simple and time-saving. You might find the user interface a little bit confusing at the beginning but its pretty straightforward once you get a hang on it. From the “Manage team” section, invite and remove team members and assign roles. You can make members Manager and Account Admin to manage and track the workflow. 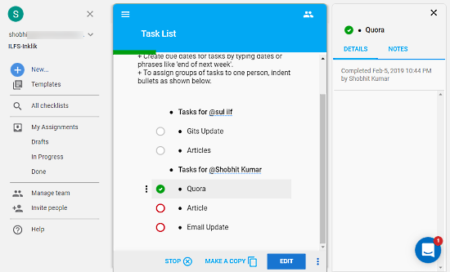 With TeamworkIQ, you can create a checklist for the workflow and assign the tasks to the team members. 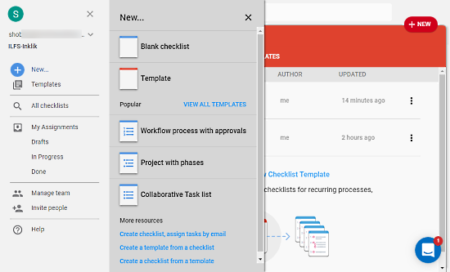 As similar tasks and processes can have similar workflows; you can create workflow templates for different types of tasks and use them instead of creating a new checklist every time. Creating a template is the same as creating a checklist. The only difference is that a checklist is for one-time use only whereas, a template is saved in the template collection that can be edited and used again and again. You can create a template by clicking the New option from the navigation panel and selecting Template option. As this service is in its Beta phase right now, there are more options which are coming in near future. You can vote for the options which you want to be added to the TeamworkIQ. Currently, options to add file attachments, links, and text form are on the voting list which are expected in the future updates. Once a checklist is started, you can stop it at any time while the tasks are still in progress. It gives you an option to add a comment where you can explain the reason why the checklist is being stopped. In case you don’t want to use a template, you can create a blank checklist with the New option and customize it as per your needs. The involved team members access the checklists along with all the other tasks assigned to them under My Assignments section. From there, they can mark the task finished in the checklist and track your/team progress. Manage your team workflow with TeamworkIQ here. TeamworkIQ is a good service that can ease the process team workflow management and save you lots of time. The reusable template feature comes handy to quickly create workflow tasks and track team performance. Give it a try and share your thoughts on this with us in the comments.